All human problems and suffering are caused by delusions such as anger, desirous attachment and ignorance. These delusions cause us to have an unbalanced mind – when things are going well we become over-excited, and when things are going badly we become depressed. By training in meditation, we can create mental clarity and peace – states of mind that enable us to control our response to pleasant and unpleasant circumstances. Gradually we develop mental equilibrium, a balanced mind that is happy and peaceful all the time, rather than an unbalanced mind that oscillates between extremes. Regular training in meditation will enable us to eradicate all mental delusions that are the causes of our problems and, in this way, we will eventually come to experience permanent inner peace. But it is important to remember while we are training in meditation, that our practice does not have to be confined to the meditation session; it should permeate our whole life. To completely experience the happiness that results from meditation, we shouldn’t allow a gulf to develop between our meditation and our daily life. 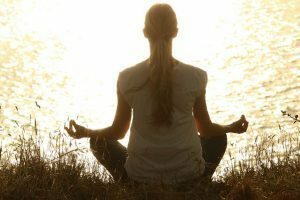 We should pay attention to our mind at all times by applying mindfulness, alertness, and conscientiousness – three terms that will be explored more fully in the course – and we should try to stop following the mental delusions that lead us toward actions that cause harm to ourselves and others. The success of our meditation practice depends on how we conduct ourselves outside the meditation session. Deep experience is the result of practical training over a long period of time, both in and out of meditation. Therefore, we should practice steadily and gently, without being in a hurry to see results. The ultimate purpose of meditation is to increase our capacity to help others, so taking time to meditate every day is an extremely valuable way to spend our time. We have to manage our time and energy in such a way that we can be of maximum benefit to others, and to do this effectively we need time alone to recover our strength, collect our thoughts, and see things in perspective. Through practicing meditation sincerely and working toward benefiting others, we will eventually become a Bodhisattva, a person whose deepest wish is to attain enlightenment so that everyone can be released from their suffering and problems. To achieve this end, Bodhisattvas have two main tasks: to benefit others as much as possible right now and to attain full enlightenment to be able to benefit all living beings in the future. Both tasks are accomplished through the practice of the six perfections: the perfections of giving, moral discipline, patience, effort, mental stabilization, and wisdom. The six perfections, and how they can be practiced in daily life, will be explained in the course. Gen Kelsang Khedrub, a western Buddhist monk for over 20 years, is a new instructor at Bellevue College Continuing Education. Having taught two sold-out Saturday events in the winter term, he will be teaching a four week evening class this spring term. Thursdays, 7:00-8:30pm from April 27 to May 18 (4 weeks). Meditation & Mindfulness in Daily Life. Item #G8960.